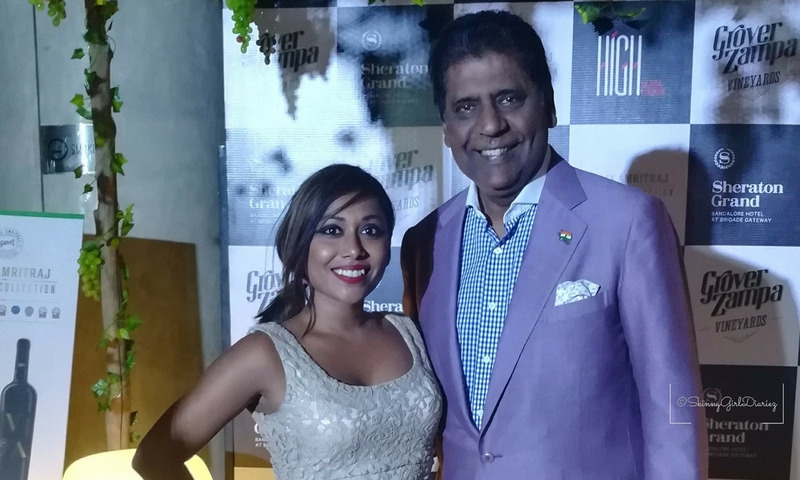 I was honoured to attend an exclusive event hosted by Grover Zampa Vineyards to celebrate the success of their ‘Vijay Amritraj Reserve Collection’. The guest of honour was the legendary former Indian Tennis Star himself, Vijay Amritraj who graced the occasion. The event was an intimate one, attended by Grover Zampa A-Team, including Founder & Chairman Kapil Grover along with CEO Sumedh Mandla and Ravi Jain, Promotor and Director. The wines were inspired by Vijay Amritraj’s legendary feats and iconic style of play. The Grover Vijay Amritraj collection exemplifies the finest India has to offer the world. As inspiring as the man himself, the wine is inimitably diverse yet smooth to the palate and gracefully well rounded to deliver a rich experience of Indian Terroir. Launched in 2014, and winning over 15 awards, that the dinner had to be a gala affair. The Venue was High Ultra Lounge, that sits on the 30th floor of the Sheraton Grand Bangalore. The various Head Chef’s from the in house restaurants at the hotel had curated an exclusive menu each paired carefully to enhance the palette with the VA Reserve Collection. The set up was just magnificent spread out, a makeshift tennis court, the dinning table set and spread across with fine cutlery and wine glasses all glittery, made for a gala affair. Sheraton Grand Bangalore, out did themselves, with the Grand Master Chef Dinner. Overall, had a lovely interaction with Vijay Amritraj over dinner, as we talked about tennis, wine and just his take on social media and acting. I had the opportunity to also have alight chat with founder of Grover Zampa Kapil Grover, who was pretty down to earth. I finally know how Grover Zampa began its roots and to where it stands today, as the second largest wine makers in the country. Taste – very fruity and rich, has a lingering flavour with its long finish. Taste – subtle hints of spices along with dark fruity flavour, well balanced. A splendid evening with great company, and some award winning wines, what a way to end the week that was. Here are some more highlights from the night! I had the opportunity to visit their beautiful vineyard in Nashik beginning of the year, and hope to visit the one in Bangalore soon. More on my next blog about the visit and the various types of award winning wines they produce. I really like your blog, classy and nice, and what great photos! Thanks for sharing!